Opening Night was a Little Drafty! Georgetown Raceway was a 1/2 mile Harness track near in Georgetown. The facility featured a glass enclosed grandstand that hosted winter racing. Georgetown Raceway was located about thirty five miles from Dover on Route 9, across from the Sussex County Airport. 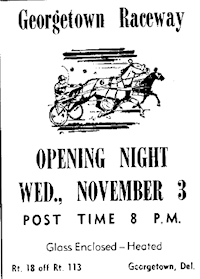 Along with Dover Downs, Harrington Raceway and Brandywine it provided year round harness racing in the first state. Before Georgetown Raceway was opened the site was known as Delmarva Raceway, not to be confused with Delmarva Downs, which is what Ocean Downs in Maryland was known as for a couple of years. Racing had been going on at the site since the 1930's. 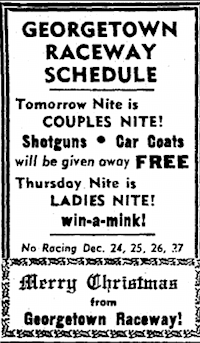 When Brandywine Raceway opened in 1953, Delmarva Raceway applied for pari-mutual dates, which it then sold to Brandywine to extend it's season. This went on until Georgetown opened in 1965. Georgetown Raceway, which only lasted seven years from 1965 to 1971, got off to a slow start when only 1,941 fans turned out for opening night. Which like most opening nights had it's problems. It seems the glass enclosed grandstand wasn't all that enclosed, as the glass for the sides of the grandstand hadn't arrived yet. Things turned around the first weekend when Georgetown hosted the first double header in Delaware on the Saturday Card. The track which featured mostly $500, claiming races never did live up to expectations, fighting to remain solvent for most of it's existence. At one point the Securities and Exchange Commission, ordered the track to close, due to financial concerns. After the 1971 season, the track finally gave up and went out of business. In 2009 there was some talk that the track would be resurrected as a racino, but that never materialized. I never made it for live racing at Georgetown, I didn't even know it existed until the last couple of years. I did visit the site expecting to see the deteriorating grandstand, but all that was there was a pile of rock, after thirty or so years they finally decided to knock it down.